Material: High strength 900D Nylon, with PVC waterproof coating, abrasion resistance,waterproof and durable. Lining: Mercerized cotton(210D Nylon) with waterproof coating. 1. 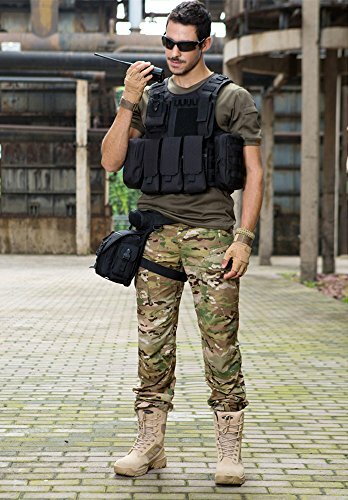 Tactical vest Size: Approx. 27.5''W*25.6''H/70*65cm, adjustable width: 50-70cm, adjustable height: 55-65, waist circumference:100-140cm. More Molle Systerm,you can hang kinds of small bags on it. Waist part is adjustable with especial velco as closing seal, refill design,very convenience. Elastic rubber band, easy to adjustment. Constructed by 900D high density nylon material. Three magazine pouches which could carry magazines with the size 7.87''(Length) x 2.36'' (Width) X 1.77'' (Thickness). Magazine pouches are with elastic band. Things also can be put into the main compartment close to the body. 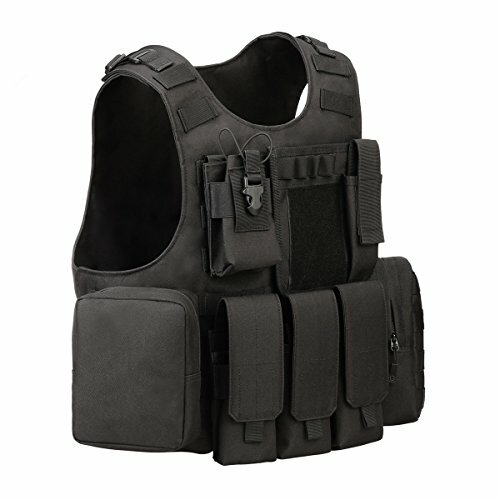 With the two adjustable foam padded shoulder straps, The tactical vest becomes more comfortable and useful. Pls pay attention to the size before purchasing. 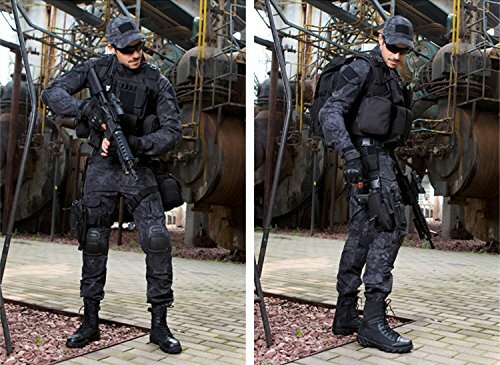 High Quality and Durable - Made of military grade 900D Nylon materials and stitching, well constructed, with a thick pvc lined nylon, strong tensile wear-resisting ability. 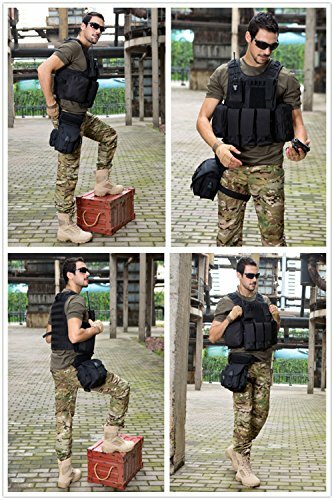 MOLLE Systerm and Multi-options bag - Various MOLLE attachment points for adding pouches. 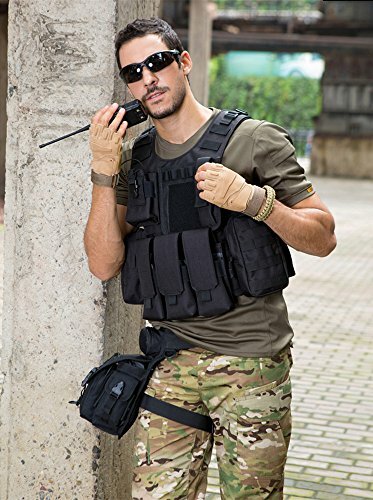 3 magazine pouches, 1 map pocket, 1 Walkie talkie and 1 flashlight pouch, 2 communication pouches and 1 medic pouch; All removable. Adjustable size. The maximum chest size around 50 inches, can be adjusted to fit shoulder and waist size,please note this important size information before place an order. Molle & Velcro. 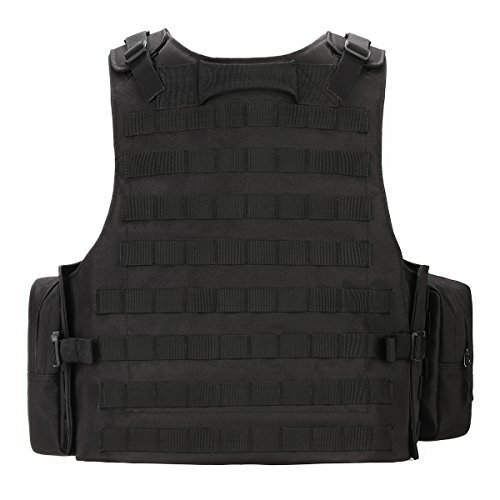 Modular lightweight load-carrying system, powerful suspension belt, strengthen tactical load-bearing, designed magic velcro. 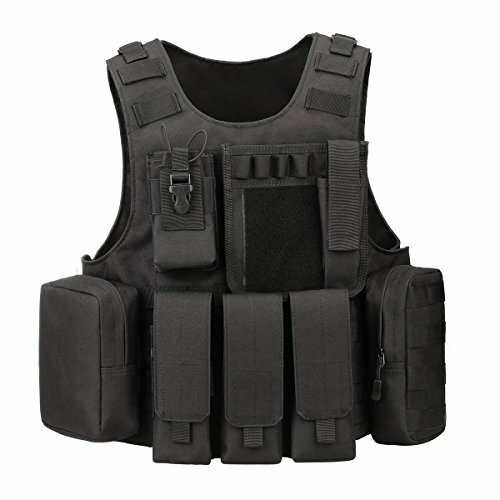 This vest is great for airsoft battle, paintball game, wargame and hunting. 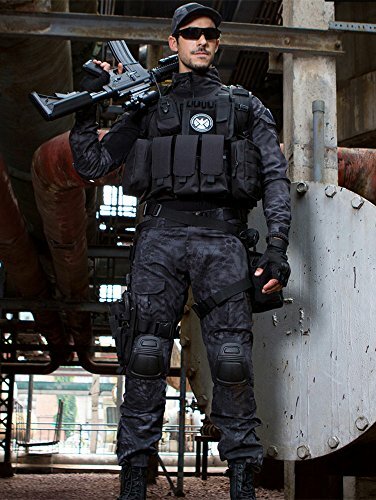 Personal protective equipment: Great for tactical training combat assualt shooting CS and so on.